Our long-term research goal is to develop new organic reactions and new synthetic routes to create cost-effective methods for producing known potent biologically active aryl compounds, and to enable the generation of new compounds to find better and safer therapeutics for human diseases. In this project, our objective is to develop a short, flexible and cost-effective synthetic procedure for anti-cancer microtubule inhibitors, tryprostatin A and B, and their analogs. Microtubules serve as structural components within cells and participate in many critical cellular processes including mitosis, cytokinesis, and vesicular transport. Inhibition of microtubule formation is regarded as one of the more successful targets for cancer therapeutic intervention. 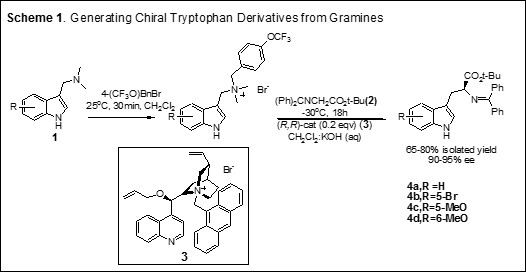 Our laboratory has developed the first novel and concise synthesis of optically active tryptophan derivatives via a phase-transfer-catalyzed (PTC) asymmetric alkylation reaction of substituted gramines 1 with glycinate 2 (Scheme 1). Several L-tryptophan derivatives 4 (the key building block of tryprostatins) were prepared in 90–95% enantiomeric excess (ee), via alkylation of glycinate 2 employing the chiral cinchonidine phase-transfer catalyst 3 (Scheme 1). 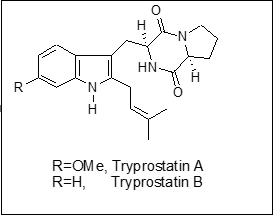 The single most important advantage of our methodology is the ability to generate the relevant chiral tryptophan derivatives (the building block of tryprostatins) in an unprecedented three-component/one-pot process from ring-A-substituted gramines. After successfully completing our initial studies, we are using our chemistry to synthesize tryprostatin A and B and their analogs. The outcomes of this research will help to develop the effective synthesis of several tryprostatin analogs, which may otherwise not be available for human use. Discovering a family of effective microtubule inhibitors will offer new hope to the millions of people who suffer from cancer. Epigenetic abnormalities participate with genetic mutations to cause cancer, and consequently epigenetic intervention of cancer has emerged as a promising avenue toward cancer therapy. Selective inhibition of histone deacetylases (HDACs) by small molecules often leads to a cascade of chromatin remodeling, tumor suppressor gene reactivation, apoptosis, and regression of cancer. HDAC inhibitors have thus gained much attention in recent years as a new class of anticancer agents. The recent discovery of two new HDAC inhibitors, Thailandepsins A and B, represents a remarkably successful example of genomics-guided drug discovery. Thailandepsins are natural analogues of FK228, an FDA approved anticancer drug. They exhibited potent inhibitory activities against class I HDACs in enzyme assays and broad-spectrum antiproliferative activities against human cancer cell lines in NCI-60 assays, and yet they have poor solubility in water and also showed undesirable levels of toxicity in preliminary testing in mice. 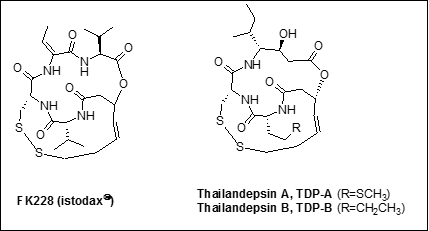 This project seeks to rationally design, synthesize and screen for new analogs of Thailandepsins A and B that would have reduced toxicity and would still retain adequate HDAC inhibitory and antitumor activities. Asymmetric Synthesis of Compounds Containing All-Carbon Center. The development of catalytic, enantioselective methods for the construction of all-carbon quaternary centers represents a daunting challenge in organic chemistry. Creating these centers is selectively difficult because of the steric congestion that is encountered during the carbon-carbon bond forming reaction. At present only a few catalytic asymmetric carbon-carbon bond-forming reactions have been shown to be useful for constructing all-carbon quaternary centers, in particular, all-carbon alpha-aryl quaternary stereocenters. There is a pressing need for more general methods for creating chiral all-carbon alpha-aryl quaternary centers as a growing number of biologically active natural products and pharmaceutical agents that possess these centers. Our long-term research goal is to develop new synthetic routes for producing known potent biologically active containing all-carbon quaternary centers, and enable the generation of new compounds for better and safer therapeutics for human diseases. In this project, our objective is to develop a short, flexible and cost-effective synthetic procedure for chiral all-carbon alpha-aryl quaternary centers from aryl hydroxyl acrylates and finally a procedure has been established (Scheme 2). An easy entry to asymmetric quaternary alpha-aryl carbon centers will now simplify the synthesis of 3,3’-disubstituted oxindole ring system. The 3,3’-disubstituted oxindole framework is an important heterocyclic motif that constructs the core of a large family of biologically active compounds such as horsfiline, coerulescine, physostigmine, flustramine and many more. 1. Eduardo Alberch, Colin Brook, Sharif A. Asad, Maria Shevyrev, Joseph S. Ulicki, M. Mahmun Hossain “Stereoselective allyl enol carbonates for synthesis of chiral aldehydes bearing all carbon quaternary stereocenters via the decarboxylative asymmetric allylic alkylation (DAAA).” Synlett 26. (2015): 388-392. 2. Sharif Asad, Joseph Ulicki, Maria Shevyrev, Nazim Uddin, Edurado Aolberch, M. Mahmun Hossain. “First Example of The Intramolecular Palladium-Catalyzed Asymmetric Allylic Alkylation of Hydroxyacrylates: Synthesis of All-Carbon -Aryl Quaternary Aldehydes.” Eur. J. of Org. Chem. (2014): 5695-5699. 3. Eduardo Alberch, Joseph S. Ulicki, Sharif A. Asad and M. Mahmun Hossain. “Chemistry of Iron-Alkyl Complexes.” Patai’s Chemistry of Functional Groups. John Wiley & Sons Ltd. (2013). 4. Robert Todd, Matthew Huisman, Nazim Uddin, Sarah Oehm and M. Mahmun Hossain. “One-Pot Enantioselective Synthesis of Tryptophan Derivatives via Phase-Transfer Catalytic Alkylation of Glycine Using a Cinchona-Derived Catalyst.” Synlett 23. (2012): 2687-2691. 5. Nazim Uddin, F. Holger Foersterling, Joseph S. Ulicki and M. Mahmun Hossain. “Brønsted Acid-Catalyzed C-C Bond Forming Reaction for One Step Synthesis of Oxazinanones.”Tetrahedron Letters 52. (2011): 4353-4356. 6. Ronald Theys, Matt Dudley and M. Mahmun Hossain. “Recent Chemistry of the 5-Cyclopentadienyl Dicarbonyl Iron Anion.” Coordination Chemistry Reviews 253. (2009): 180-234. 7. Robert C. Todd and M. Mahmun Hossain. “A Practical Synthesis of Indole-Based Heterocycles Using an Amido-aluminum-Mediated Strategy.” Synthesis (2009): 1846-1850. 8. Mary Rose Atuu and M. Mahmun Hossain. “Dynamic Kinetic Resolution of Tropic Acid Ethyl Ester and Its Derivatives.” Tetrahedron Letters 48. (2007): 3875-3878. 9. Matt Dudley, Monzur Morshed, M. Mahmun Hossain. “A Convenient Method of Synthesizing 3-ethoxycarbonyl Benzofurans from Salicylaldehydes and Ethyl Diazoacetate.” Synthesis (2006): 1711-1714. 10. Shahidul Islam, Courtney Brennan, Qinwei Wang, M. Mahmun Hossain. “Convenient Method of Synthesizing 3-Ethoxycarbonyl Indoles.”J. of Org. Chem. 71. (2006): 4675-4679. 11. Matt Dudley, Monzur Morshed, Courtney Brennan, Shahidul Islam, Syarhabil Ahmad, Mary-Rose Atuu, Bryan Branstetter, M. Mahmun Hossain. “Acid Catalyzed Reactions of Aromatic Aldehydes with Ethyl Diazoacetate: An Investigation on the Synthesis of 3-hydroxy-2-arylacrylic Acid Ethyl Esters.” J. of Org. Chem. 69. (2004): 7599-7608. 12. Mark Redlich, M. Mahmun Hossain. “Synthesis of Asymmetric Iron-Pybox Complexes and Their Applications to Aziridine Forming Reactions.” Tetrahedron Letters 45. (2004): 8987-8990. 13. M. Mahmun Hossain “Synthesis of 2-Aryl Propenoic Acid Esters for the Production of Non-Steroidal Anti-Inflammatory Drugs.” US patent 6683205 B2, January 2004. 14. Bruce Heuss, Shawn Dennis, Michael F. Mayer and M. Mahmun Hossain. “Iron Mediated Nitrenoid Transfer: [(5-C5H5)Fe (CO)2 THF]+ Catalyzed Aziridination of Olefins.” Inorganica Chimica Acta 342. (2003): 301-304. 15. Mark Redlich, Michael Mayer, M. Mahmun Hossain. “Iron Lewis Acid Catalyzed Organic Reactions.” Aldrichimica Acta 36. (2003): 3-13. 16. Qinwei Wang, F. Holger Foersterling and M. Mahmun Hossain. “Enantiospecific Cis-Cyclopropane Syntheses Using the Chiral Iron Carbene Complexes S and R-[(5-C5H5)(CO)2Fe=CH(6-o-MeC6H4)Cr(CO)3]+.” Organometallics 21. (2002): 2596-2598 (2002). 17. Syed J. Mahmood and M. Mahmun Hossain. “Iron Lewis Catalyzed Reactions of aromatic Aldehydes with Ethyl Diazoacetate: Unprecedented Formation of 3-Hydroxy-2-Arylacrylic Acid Ethyl Esters by a Unique 1,2-Aryl Shift.” J. of Org. Chem. 63. (1998) 3333-3336. 18. Michael F. Mayer and M. Mahmun Hossain. “Catalytic Preparation of Cis-Aziridines by an Iron Lewis Acid.” J. of Org. Chem. 63. (1998): 6839-6844. 19. Ronald D. Theys, Roy M. Vargas, Qinwei Wang and M. Mahmun Hossain. “A Method for the Synthesis of Carbene Precursors from Aldehydes and the Metalates (5-C5H5)(CO)2Fe- and (5-C9H7)(CO)2Fe-.” Organometallics 17. (1998): 1333-1339.